HUNTINGTON, W.Va. – The Violauta Duo of Wendell Dobbs on the flute and Júlio Ribeiro Alves on the guitar will perform a joint faculty recital, “Rossiniana 2,” at 7:30 p.m. Thursday, Jan. 18, in Studio 143 of the Smith Music Building at Marshall University. 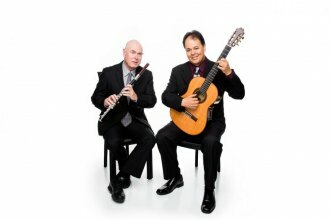 The first part of the recital represents a continuation from the fall semester of the duo’s examination of opera arias by Gioachino Rossini transcribed for flute and guitar by flutist Jean-Louis Tulou and guitarist Ferdinand Carulli. They include arias from La Gazza Ladra (The Thieving Magpie) and the tour de force, Matilda’s aria from Elizabeth, Queen of England. The duo will perform these transcriptions on period instruments produced in France during the first half of the 19th century. The second part of the program will feature Dobbs and Alves exploring other repertoire from the early 19th century, all by guitar masters from the era. The performance will feature another work by Carulli, then works by Antonio Nava and Mauro Giuliani.